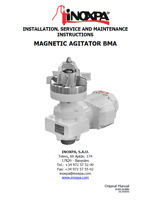 The range of magnetic agitators BMA is a highly hygienic solution for the applications of dispersion, dissolution, homogenization and mixing in the pharmaceutical, biotechnological and food-processing industries. 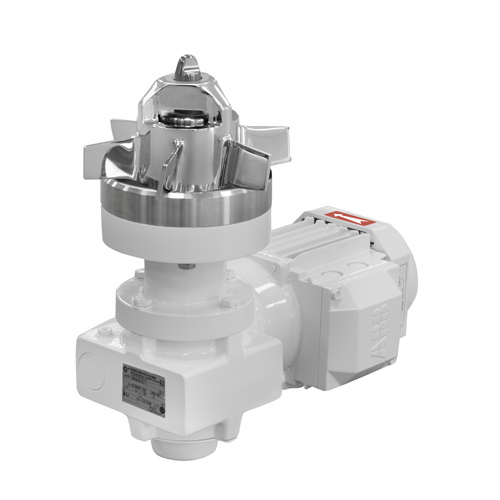 Due to the magnetic coupling they are especially useful because they avoid any possible contact of the product with the atmosphere. When solids or liquids are added into the vortex created by the magnetic agitator, they are transferred straight to the rotor. The rotor transforms the axial movement of the medium into a radial acceleration from the centre of the rotor towards the wall of the vessel. The added medium is well distributed ensuring a homogeneous mixing of all the volume. 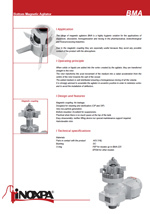 It is strongly advised to assemble the agitator in eccentric position in order to minimize vortex and to avoid the installation of deflectors. Designed for cleaning and sterilization (CIP and SIP). Bottom mounted. Excellent for suspensions. Practical when there is no much space at the top of the tank. Easy disassembly: neither lifting device nor special maintenance support required.